When Dyson Racing’s two AER-powered Lola B06/10s take their places on the Sebring grid this month, the cars and drivers will be center stage, of course. But it will have taken the work of more than a score of other people in the team to get them there, along with that of scores more at suppliers Lola and AER. In the first feature of our on-going Dyson Racing coverage, we described the new Lola and its AER twin-turbo, and told you a little about the folks at Lola Cars International and Advanced Engine Research. Here we’re going to introduce you to the rest of the Dyson team. You see and hear a great deal about the drivers and the cars at every American Le Mans Series race, but the rest of them are like the interior linemen of American football; you rarely hear about them unless they screw up – and since these guys don’t screw up often, you might not know anything about them at all. 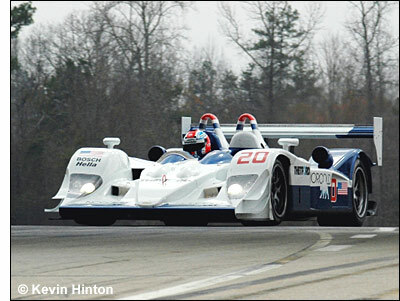 Chris Dyson tells us that, “Dyson Racing was actually Rob Dyson Racing for the first years of club racing. When Dad started running in professional events in 1983 the team was then officially known as Dyson Racing.” That first race was an SCCA regional race at Watkins Glen in 1974. Rob Dyson won. The team grew by one two years later, when long-time crew chief Pat Smith (now retired) came on board. Motor sports columnist Andrew Hartwell, now writing for The Race Site, interviewed Pat in 1997, and wrote us just the other day to tell us that “I asked Pat how he and Rob came to join forces.” Andy went on to quote Pat in his 1997 article. “I was teaching an auto mechanics course at Duchess County (New York) BOCES, and one day Rob came in looking for a student who would be willing to work on his racing efforts on weekends and during the summer,” recalled Pat. “We got to talking. It was only my second year of teaching and I needed to work somewhere in the summertime anyway - and so I decided I would go work for him. I was 32 years old then and I’m 53 now, so we have been together for 21 years. 1997 marks our 22nd season together. In those IMSA years, the number 16 Porsche became a familiar and popular part of the “Porsche brigade,” an experience that certainly taught the team much about patience, and about competing with the best of the best, which included the “ex-officio factory team” of the time, Holbert Racing. Now it is – and has been – the likes of BMW (who can forget the classic 1999 Sebring finish? ), Panoz, and of course Audi that are the recent factory teams, and you can forget the “ex-officio” part. But while others have fled the scene, Dyson Racing remains. As Rob put it after this past season’s victory over Champion Racing at Mosport, “Winning means the most when you beat a worthy opponent.” That’s what keeps Dyson Racing in the American Le Mans Series. 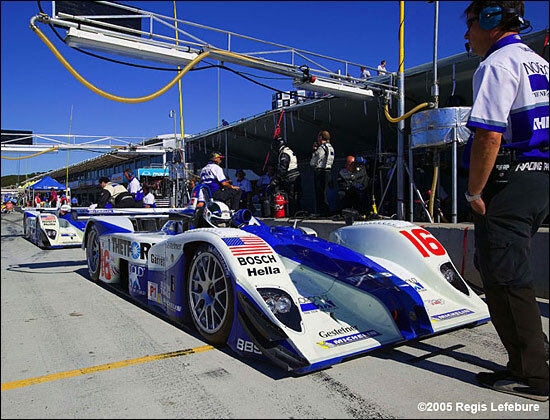 So who are these guys – and one gal – who are “Dyson Racing” in 2006? Not counting (we’re taking liberties here) the Chairman of the Board, Rob Dyson, the President, Chris Dyson, and the drivers, James Weaver, Butch Leitzinger, Chris Dyson, and Guy Smith, with Andy Wallace joining for long enduros, there are twenty-two members of Dyson Racing Team, Inc., the name that appears on race entries. We’ll give you an overview and an introduction here, then we’re going to feature individuals as we go through this American Le Mans Series racing season. Get ready to get “up close and personal” with a very different bunch. John ‘Boz’ Pultz, 47, of Pleasant Valley, the team’s fabricator and a mechanic on the #16 Lola. Vince Carr, 42, of Armenia, New York, is in charge of all fueling, of pit set-up, and drives the #16 car tractor trailer. Jim Wirehouse, 50, sometimes called ‘Nut,’ lives in Millbrook, New York. He works with Frank Babineau (Michelin) in preparing tires for both Lolas, works in the body shop when in Poughkeepsie, and does the decals for both cars. Darren Arns, 32, of Wappingers Falls, NY is the Head Mechanic for the #16 car, responsible for all preparation and maintenance. At the track he works with Peter Weston making set-up changes to that car, and dealing with drivers Butch Leitzinger and James Weaver. That doesn’t sound easy at all. Matt Charland, 41, of Pleasant Valley, is the team’s composite man, responsible for carbon fiber work and repairs. In addition to that, Matt is responsible for ‘driver comfort’ items – seats, seat belts, drink bottles, etc. Mike White, 39, New Paltz, New York, is Dyson Racing’s shock and gearbox technician, but also calls race strategy and is in charge of the #16 car during races. He works with Peter and James on shock set-up. Having been responsible for gearboxes over the past four years, he’s now training Cliff Hauck to assume those responsibilities. Cliff Hauck, 28, Greenville, New York, is the gearbox technician who builds and maintains gearboxes for both cars. Tony DiMarco, 34, of Rhinebeck, NY, is a composite and body man, and is the team’s head painter. Scott Halupke, 44, of Pleasant Valley. They work together to prepare and maintain the #20 Lola. Kyle Davidson, 46, of Lagrangeville, NY, is the team’s full time machinist. He stays at the Poughkeepsie shops. Nine of the twenty-two Dyson crew are part time, which usually means that they join the team at race events, where they have responsibilities directly related to preparing and racing the two Lolas. 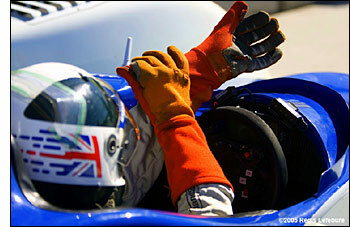 Peter Weston, 45, a native of Leicester, England who now lives in Norwich, England, is the team’s Head Engineer. He works on chassis set-up and takes on car design issues with the team and with Lola. During races, Peter calculates fuel consumption and determines fuel strategy. Vince Wood, ‘V2’ is 41, a native of Knoxville, Kentucky and a resident of Indianapolis, Indiana. 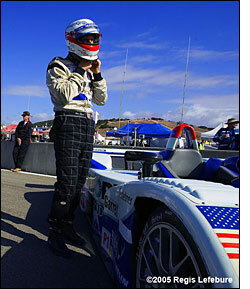 Vince is Dyson Racing’s data acquisition engineer. He is in charge of the PI system – instrumentation – and data management for both cars. Vince helps Mike, Randall, and Peter with race strategy. David Fryer, of Pittsburgh, Pennsylvania, is the tractor-trailer driver for the #20 Lola, maintains the team’s paddock tent areas, and helps Vince Carr with pit set-up. Stan Lent, 24, from Milbrook, NY, is a student at Rochester Institute of Technology in Rochester, NY. When with the team he works as an assistant mechanic, helping with preparation and repair of both Lolas. Jared ‘J-rod’ King, 18, is a student at Wyoming Technical Institute (Wyo Tech) in Laramie, Wyoming. From Pleasant Valley, he helps Tony DiMarco and Matt Charland in the composite shop and paint shop. Brian Berry, of Jacksonville, Florida, is the fueling vent man for the #16 Lola, and the team’s machinist at the track. Randy Meeker, Jacksonville, Florida, is the fueler for the #20 Lola and helps with pit set-up and maintenance. Julio Williams, formerly of Ceiba, Puerto Rico, now Jacksonville, Florida, is the vent man on the #20 Lola. Tim Adams, 30, of Salt Point, New York is the team’s tire assistant. He helps Jim Wirehouse at the track with tires for both cars. If you’re at Sebring above or across from the pits, or watching on television, look for the “over-the-wall” crews for the two cars. 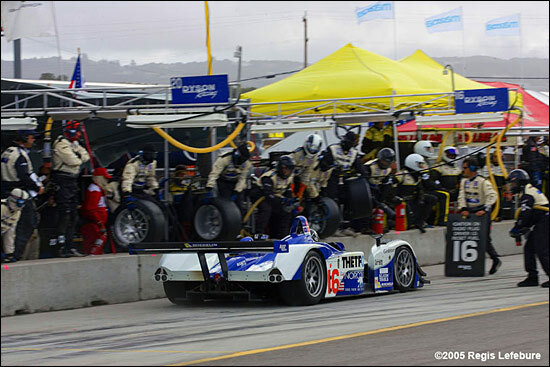 When the #16 Lola pits, with James Weaver, Butch Leitzinger, or at Sebring Andy Wallace driving, the man at the front of the car with the headset and clipboard, directing the action, is Mike White, who calls the race. Vince Carr is the fueler, with Bryan Berry on the vent. David Fryer has the fire bottle. Tire changers are Darren Arns, ‘Boz’ Pultz, Tony DiMarco, and Matt Charland. When the #20 Lola pits, with Chris Dyson or Guy Smith driving, the man at the front is team manager Randall Kelsey, who calls the race. Randy Meeker is the fueler, with Julio Williams on the vent. The fire bottle is in the hands of Tim Adams. Tire changers are Cliff Hauck, Lou Murasso, Scott Halupke, and Stan Lent. On both cars the “deadman” is whatever crew member is available; the “deadman” holds the fueling rig valve – should he drop his hold for any reason, fuel flow will stop. Here’s a photo of the “road crew” taken last year. Although there are a few internal changes, there has been zero turnover on the Dyson Team beyond Guy Smith partnering Chris in the #20 Lola. From left to right; David Fryer, John ‘Boz’ Pultz, Vince Carr, Peter Weston, Stan Lent, Jim Wirehouse, Darren Arns, Jared King, Randall Kelsey, Matt Charland, Mike White, Tony DiMarco, Lou Murasso, Scott Halupke, Cliff Hauck, Vince Wood. “What a motley group,” joked Randall. Twenty-two crew, five drivers, and Rob – twenty-eight. We can add three more, publicist Brian Wagner, and photographers Regis Lefebure and Dr. Brian Mitchell. The latter two are well known for their published work, while the former writes the team’s news releases, and behind the scenes provides much of the information for Dyson Racing in race reports and other stories. Finally, look for Bob Leitzinger. Bob, of course, is not only Butch’s dad, but a famous sports car driver in his own right, IMSA GTU driver’s champion in 1989, and runner-up to son Butch in 1993. Bob often keeps lap charts and notes. By the time this group have completed the bulk of their work, it's 'simply' down to the likes of James to pull on his (rather frayed looking) gloves, Chris to pull on his helmet - and for the four / five drivers to complete the task. So thirty-two people who make Dyson Racing go. Stay with us here through the season and you’ll learn much more about them.